A course to train 50 judges and magistrates kicks off in Cameroon? Cooperation activities between Italy and Cameroon to foster the Rule of Law and the respect of human rights are continuing thanks to the new high-level training courses promoted by the Scuola Superiore Sant’Anna of Pisa and the Ministry of Justice of Cameroon. The project received logistic support from ENAM (Eacute;cole Nationale d’Administration et de Magistrature du Cameroun) and was performed in partnership with the Ministry of Foreign Affairs and International Cooperation, under the scientific coordination of Andrea de Guttry, full professor of international law and director of the Dirpolisrdquo; (Diritto, Politica, Sviluppo � Law, Policy, Development) Institute of the Scuola Superiore Sant’Anna of Pisa. The first high-level training course is held in Yaoundeacute; (Cameroon) and involves 35 judges and magistrates singled out by the Ministry of Justice of Cameroon and another 15 young judges selected by ENAM. The programme, organised in four course days, offers the possibility of getting acquainted with the international human rights laws applicable in the administration of justice. Participants can also acquire in-depth knowledge on the content of the laws protecting human rights and on the mechanisms to enforce them at national level. The second phase of the project, which consists in another high-level training course, will continue between May and June 2017 with a new cycle dedicated to the training of trainersrdquo;, again held in Yaoundeacute;, for approximately 35 Cameroonian judges. The course will train a pool of trainers who will in turn be able to provide capillary training on human rights to all the members of the judiciary in Cameroon. Source: Ministry of Foreign Affairs of Italy. Throughout Africa, businesses are adopting the Creating Shared Value (CSV) business model to ensure that society benefits while business profits. The concept, first shared with business leaders and marketers by Harvard Business School’s Prof Michael Porter in 2006, is gaining momentum and picking up traction � but not quickly and forcefully enough. For too long, companies have relied on CSR and CSI programmes to balance their focus on maximising profits. Shared Value is now challenging the status quo. The first Africa Shared Value Summit (www.AfricaSharedValueSummit.com) will raise awareness and advocate for the strategic implementation of the Shared Value business model, which brings about social change while positively impacting profit. Companies who create Shared Value do so through the normal operation of their businesses; it is not an (often short-term) add-on limited by budget, but rather a future-proof business strategy for long-term gain. There are corporates that are currently taking the lead in changing the face of capitalist business practice, but it is the social innovators who are really embracing the practice and reaping the rewards � financially and societally. Marc’s expertise spans numerous subjects, including Shared Value, collective impact, agricultural development, impact measurement, and the mechanics of collaboration. His influential articles Innovating for Shared Valuerdquo; (http://APO.af/fnU90l) and The Ecosystem of Shared Valuerdquo; (http://APO.af/OKfZQ2) were published in the Harvard Business Review in 2013 and 2016 respectively. Prior to FSG, Marc served as Principal at The Boston Consulting Group (BCG) based in Zuuml;rich. Chief Marketing Officer of Nando’s, one of the Summit’s sponsors, Doug Place has received more than 30 international and national marketing and advertising awards, including The Media Top 40 Under 40rdquo; in 2014, and was recognised as one of Destiny Man Magazine’s 2015 ‘Young and Powerful’ industry leaders. Through the implementation of Shared Value principles, Nando’s has achieved major successes in the development and recognition of African artists and the fight against malaria. Another speaker highlight is Barry Swartzberg, Group Executive Director Responsible for International Strategy at Discovery. Discovery Health’s pioneering approach to incentivising people to be healthier is world-renowned. The impact of the adoption of a Shared Value strategy underpins the organisation’s global success and new business growth. Other high-profile speakers include Sanda Ojiambo, Head of Corporate Responsibility at Safaricom, who will share her experience in multi-sectoral policy and development work throughout Sub-Saharan Africa, and Maria Papetti, Head of Enel Holdings, who will speak on sustainability, renewable energy growth and social equality. The Summit will also feature Shared Value trailblazers like Dr Sara Saeed, winner of the UNICEF Global Goal Campaigner Award 2016, who will share insights into the doctHERS project in Pakistan. Other participants include:Michelle Constant (CEO, BASA); Gordon Cook (Activist, Stir4Change); Zaakira Mahomed (Founder, Happy with a Purpose and Mina Cup), David Blyth (CEO, Yellowwood); Claire Reed (CIO, Reel Gardening); Genevieve Leveille (Co-Founder, 0TenTic8); Cecilia Kinuthia-Njenga (UNEP Head, South Africa); and Thomas van Viegen (EY Associate Director: Climate Change and Sustainability Services). Embracing CSV is the key to long-term sustainability, enabling businesses to survive and thrive in a changing business climate. Shift Social Development, the team of women behind the Summit headed by Tiekie Barnard, aims to create an annual platform where Shared Value practitioners can share their stories and influence businesses and brands in the creation of Shared Value, thus embodying the Shift Social Development mantra of profit with purpose. Source: Africa Shared Value Summit. Here’s a quick quiz: Which country has the UN called the largest food insecurity emergency in the world? Is it Nigeria, where the northeast has been hit hard by the Boko Haram insurgency? How about Cameroon, Chad, or Niger, also on the borders of Lake Chad and dealing with the fallout of the same crisis – all the focus of today’s Oslo donor conference to raise funds for the region? Perhaps South Sudan, where famine has just been declared? Wrong, wrong, and wrong again. It’s Yemen, where this week the UN warned that 7.3 million people are on the brink of famine. This is almost entirely a man-made crisis created by two years of war, and while new UN Secretary-General Antonio Guterres is making an effort to restart peace talks, there doesn’t appear to be much appetite by the warring parties. Yemen is a tough place to report from and to draw attention to for reasons we’ve detailed again and again. Next week, we’ll give it another go with two exclusive reports on what the looming famine looks like in what was already the poorest country in the region, even before the fighting began. Anti-immigrant sentiment has reared its ugly head again in South Africa with stores looted, buildings set aflame, and people being attacked on the streets of Pretoria, the country’s capital, just for looking foreign. Armed police are breaking up protests and Nigeria is calling on the African Union to get involved to tamp out the xenophobic fervour. We’ve been here before. Bloody anti-immigrant riots in 2008 left scores dead and thousands displaced. More recently, in 2015, seven people were killed after an angry mob wielding makeshift weapons attacked immigrants and torched buildings on the streets of Johannesburg. A similar riot broke out in Durban the same year, leaving five dead and causing thousands of foreigners to flee. But, as IRIN’s Africa Editor Obi Anyadike explained at the time, xenophobia doesn’t exist in isolation. South Africa’s unemployment rate is at a near-record high, and many are falling victim to the perception that the country is becoming overrun with immigrants who are all taking their jobs. True, South Africa is a sought-after destination for many fleeing conflict and economic hardship elsewhere in the continent. But research shows that foreign migrants are net contributors to the economy and that the numbers of those born abroad has declined anyway. Appeals for calm are all very well, but the government needs to get serious about tackling income inequality and addressing the socio-economic roots of the problem. The International Aid Transparency Initiative (IATI) is a powerful but complex set of rules to structure data about development and humanitarian financing. IATI data from donors and aid agencies describes hundreds of thousands of projects, budgets, transactions, disbursements and results. Many of the biggest donors produce reports in the format, often providing detail not easily available elsewhere. However, the voluntary initiative suffers from wide variation in data quality and completeness and can be intimidating for the non-specialist to grasp. IATI is tentatively adopted as the data standard for a new era of humanitarian finance transparency, called for in the Grand Bargain, but critical mass seems a way off. IATI open data advocates gather in Dar es Salaam early March for an annual meeting to steer a way forward. Dubbed Gimme Shelter, organisers are billing this as the “world’s first film festival exploring the connections between climate change and migration”. The four-day event kicks off in Newcastle, UK, on 16 March, and it features films as well as lectures and art exhibitions. One talk delves into controversial media coverage linking climate change to Syria’s civil war, and “examines some of the latest research exploring the links between climate change and armed conflict.” Films include “The Age of Consequences”, which investigates the impact of climate change on security and comes with the tag line: “The Hurt Locker meets An Inconvenient Truth”. This Wednesday, 1 March, join us at the opening of the exhibition “The Swedish Freedom of the Press Unfolded” and hear how Sweden came to be a forerunner for freedom of the press. Join live – on the spot at La Passerelle in Geneva’s Palais des Nations, or remotely via our Facebook page. Not so humble brag: IRIN’s recent map and listicle on foreign military bases in Africa is proving very popular. Ten months ago, we attempted a more ambitious map outlining more than 40 ongoing conflicts around the globe. But credit where credit is due: This “Global Conflict Tracker” from the Council on Foreign Relations’ Center for Preventive Action is as good, if not better. Visually, it clearly surpasses our April 2016 effort, but this is part of the problem. Using pretty, coloured circles to distinguish different levels of “impact on US interests”, it has a three-pronged scale from critical to significant to limited. Scroll down from the map itself and these grades of US interest become separate sections with thumbnails taking you to extensive briefings on each conflict. But studying these reveals a depressing subtext: Unless the United States has a vested interest in a conflict, no one really cares. At the high-end, unsurprisingly, are only countries that have seen direct US military involvement: Afghanistan, Iraq, Libya and Syria, plus those to do with rival superpower China. But it’s the lowest end of the spectrum that is more revealing. It reads like a compendium of the world’s most neglected conflicts. IRIN readers will know them only too well: Somalia, Congo, Central African Republic, South Sudan, Myanmar, Mali, and Burundi. Yemen does makes it into the middle “significant” category, but then again US Navy SEALs performed an ill-judged raid there recently and the Pentagon is reportedly considering ramping up US involvement. Looking at this map, and the conflicts marked critical, that might not be a good thing. One reason is alluded to in the entry above, but there are many others as to why Central African Republic finds itself in renewed turmoil. If depth of despondency or complete lack of hope could propel a crisis onto the front pages, CAR would surely have a chance. Regular IRIN contributor Philip Kleinfeld does his best here: Stunning photographs and vivid frontline testimony. The underlying facts speak for themselves: no government control outside the capital; violence spreading within and between different Muslim communities, let alone the Christian-Muslim dynamic that characterised the previous conflagration in 2013; record displacement above 410,000; UN peacekeepers struggling to prevent the conflict from enveloping the second city of Bambari. Oh, and innocent civilians are routinely targeted because of ethnicity. “They turned up in vehicles and were shooting everywhere,” Issa, 26, tells IRIN. “My husband fought back to protect the community, but he was shot in the head.” This is great reporting. But will it make a blind bit of difference? A total of US $672 million was raised on Friday at a humanitarian conference in Oslo, Norway, to address the crisis in the Lake Chad region, the UN says. Co-hosted by the Scandinavian country, Nigeria, Germany and the UN, the meeting aimed to address the huge crisis unfolding in a region where 17 million lives are at risk. A civil society meeting was also held on the same day, with a large participation from local organizations working in Nigeria, Chad, Niger and Cameroon. Friday’s donor pledges sent a strong signal to the world that catastrophes like famine can be averted, the UN Emergency Relief Coordinator Stephen O’Brien said at the close of the Oslo donor conference on Friday. The money is earmarked to help people affected by the emergency in the countries that make up the Lake Chad Region like Nigeria, Niger, Chad and Cameroon. The UN and its partners were able to raise a third of the US $1.5 billion appeal to donors “in just one morning”, Mr O’Brien confirmed. Speaking to reporters, he said he was thankful for the donations. The Islamic militant group, Boko Haram, that triggered the crisis, is one of the deadliest in the world, warned the Nigerian Foreign Minister, Goeffrey Onyeama. As civilians come out of the areas liberated by a West African regional force created to combat the insurgents, he said, the Nigerian government is facing new challenges to feed, house and protect them. UN Humanitarian Chief O’Brien also launched the “Nigeria Humanitarian Fund” to support life-saving operations in the North-East. 24 February 2017 &#150 Giving voice to people affected by conflict and complex crises in Africa’s Lake Chad region, a United Nations-supported conference in Oslo today generated more than $670 million in pledges that will sustain critical relief operations over the next two years and beyond. Officially known as the Humanitarian Conference in Oslo for Nigeria and Lake Chad region, the donors event also agreed on addressing longer-term development needs and to seek durable solutions to crises in Nigeria, Chad, Niger and Cameroon – which together make the Lake Chad region. According to estimates, about 17 million people are living in the most affected areas across the four countries. Of them some 10.7 million people are in need of immediate humanitarian assistance, with 8.5 million in north-eastern Nigeria alone, having been made witness to years of violence as a result of Boko Haram militancy. 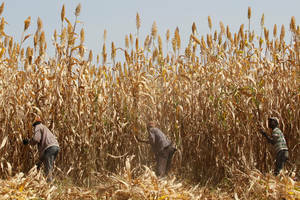 Men work on a farm in a village on the outskirt of Zaria in Nigeria’s northern state of Kaduna. The country’s worst hit states of Yobe, Borno and Adamawa have seen virtually no harvests for three to four years, making agriculture assistance more important than ever. 24 February 2017, Rome – As conflict and instability continue, the food security situation in Nigeria and the Lake Chad Basin is drastically deteriorating, FAO warned today, as it called for swift and decisive action from the international community to protect the livelihoods of millions of families dependent on farming, livestock and fishing for their food and livelihoods. Some 7.1 million people are now severely food insecure across the four countries. Among them are 515 000 children who are suffering from severe acute malnutrition – a condition which, if untreated, can lead to permanent damage to a child’s development and even death. “In the worst-affected areas, famine continues to loom — and millions will remain trapped in cycles of severe hunger if we don’t enable farmers to start cropping now,” said Dominique Burgeon, Director of FAO’s Emergency and Rehabilitation Division, who is representing FAO at the conference. “Our collective efforts cannot be limited to merely avoiding massive famine – they need to allow people to return to a dignified life. And supporting agriculture is the key to both,” he said. Violence related to the armed group Boko Haram in northeastern Nigeria has spilled over to parts of neighboring countries in the Lake Chad Basin – specifically, Cameroon’s Far North, western Chad and southeastern Niger – with devastating effects on food security and livelihoods. A total of $232 million will be needed to secure food production and access to food for three million people in the worst-hit areas over the next three years. The vast majority of the requested funds – some $191 million – is designated for Nigeria, which is bearing the brunt of the crisis. The UN foresees around 120 000 people facing famine conditions in Nigeria. Of this number, the vast majority – some 96 percent — are expected to be in Borno. Emergency farming assistance must go hand in hand with food assistance for it to be successful throughout the upcoming lean season. To this end, FAO is collaborating with the World Food Programme to ensure vulnerable families — mainly IDPs and host communities — receive food assistance, and at the same time agriculture-based livelihood support in the form of provision of seeds, tools and fertilizer. This way, they will able to restore and protect their livelihoods and farming assets for ongoing food production. FAO’s long-term strategy for the Lake Chad region puts a special emphasis on supporting refugees, internally displaced families and host communities, as these are the most vulnerable groups in this crisis. Interventions are geared to improving their food security and nutrition and building their resilience so they are better equipped to handle future shocks. In addition, restoring agriculture-based livelihoods will offer a unique opportunity to pave the way to recovery and peace in the affected areas. Orlando Bloom, British actor and Goodwill Ambassador for the UN Children’s Fund (UNICEF) recently travelled to Diffa in south-east Niger where he met with children and families displaced by an insurgency led by Boko Haram militants. The Diffa region currently hosts over 240,000 internally displaced persons, refugees and returnees, including 160,000 children. Governments are being asked by the UN to help prevent a famine in the Lake Chad Basin which straddles the borders of Niger, Nigeria, Chad and Cameroon. The uprising by the Boko Haram Islamic militant group began eight years ago and was mainly contained in and around northern Nigeria. The violence has now spread to three other countries: Niger, Chad and Cameroon. More than 2.3 million people have been forced out of their homes because of the violent attacks and abductions carried out by Boko Haram, but also because of an ongoing regional military offensive to flush insurgents out of the West African region. Hundreds and thousands of children across the region are displaced and are at risk of malnutrition. By going to Niger, UNICEF Goodwill Ambassador, Orlando Bloom hoped to shed light on the gravity of the humanitarian crisis unfolding in the Lake Chad Basin. As a father, Mr Bloom said, it was hard for him to hear the grim stories about children fleeing on foot and leaving everything behind, including the safety of their homes and classrooms. Mr Bloom has supported UNICEF since 2007. 23 February 2017 &#150 Ahead of a major donor conference in the Norwegian capital, Oslo, seeking to generate global action to tackle the complex crisis in Africa’s Lake Chad Basin, the top United Nations relief official highlighted that investing in support for the region will in turn help strengthen broader security around the world for all to benefit. “The opportunity we have at this gathering in Oslo [is for a partnership] between those who have been calling for enormous amounts of support [in the region and] to make sure that we can meet the needs of people as they go through terrible suffering, through no fault of their own,” UN Emergency Relief Coordinator Stephen O’Brien told UN News. The UN aid chief’s comments come ahead of the Oslo Humanitarian Conference on Nigeria and the Lake Chad Region, which will be held tomorrow and which will be hosted by Norway, together with Nigeria, Germany and the UN. Aiming to draw attention to the crisis, which has been largely overlooked, the event seeks to mobilize greater international involvement and increased funding for humanitarian efforts to prevent the situation from deteriorating further. According to the Office for the Coordination of Humanitarian Affairs (OCHA) – the UN’s relief wing ¬– nearly 11 million people in the region, comprising Cameroon, Chad, Niger and Nigeria, need humanitarian assistance suffer from severe acute malnutrition, among them, about half a million are very young children – babies. The appeal, amounting $1.5 billion will fund relief operations in the region, including, inter alia, providing life-saving food and nutrition support to 1.6 million people, livelihood support to 1.4 million, primary health care for 4.4 million, measles vaccinations for over one million children, education support for almost 300,000 girls and boys and safe water, improved sanitation and hygiene for 2.3 million displaced families and their host communities. Of the total population in need (10.7 million), about 8.5 million are in north-eastern Nigeria which has seen years of violence as a result of Boko Haram militancy. Pointing out that the 2016 appeal was only about 50 per cent funded, he underlined that it meant that “we can only do about half of what we know needs to be done,” said Mr. O’Brien, also the UN Under-Secretary-General for Humanitarian Affairs and the head of OCHA. But even at the best of times, the needs of the country’s mostly poor 182 million population meant it had limited resources to respond to a major humanitarian crisis. Resources are sharply lower since the slump in oil revenues since late 2014 and have been depleted further since January 2016 by the sabotaging of domestic production by armed groups in the Niger Delta.